When you child attends his or her first karate lesson you leave the world behind and realize this is a new journey dedicated to their personal growth. As a child, you will develop better attention at home and school, better coordination and speed to become a better athlete, more respect and courtesy to make more friends, better cooperation and trust for greater family relationships. As a teenager or adult, you will learn situational awareness, not to be a victim, becoming a healthy, centered individual. 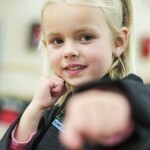 Action Karate offers martial arts instruction in a safe and positive environment.